What is the point of investing in people if the organizational system constantly interrupts and slows down the development and expression of their talents? In a changing world, what is our organizational model? Is it fast, agile and allows for the development and well-being of its members? Why are more dynamic companies leaving the traditional ones behind? What model best suits us? Hierarchy? Networkarchy? The Teal model? Holarchy? The dual operating system? Depending on what we decide, we will be mutilating or developing intelligence, responsibility and collective leadership. Our survival, the success and well-being of our company, will depend on all this. And the author makes reference to all this in this book, destined to be one of the essential references within the Spanish literature on management. Let’s prepare our company for the management of the future. 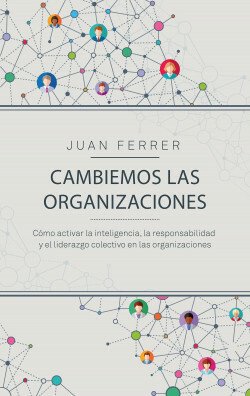 Ferrer places us masterfully at the center of the different paradigm shifts that leaders, companies and organizations face in a constantly changing society. Cutting-edge and disruptive reading that serves as a manual for all of us leaders who have lived in VUCA environments. A brave book. The author does a magnificent job of understanding and reflecting the reality of today’s organizations and their miseries. He does an even better job of proposing solutions when he advocates disruptive rather than evolutionary change, based on something as simple as treating people as people. With a very practical approach, Ferrer invites us to question the status quo in order to expand our intellectual comfort zone by breaking assumed paradigms which reality is beginning to question. The key is to allow people to bring about change in the organization. Do you dare?